There's so much excitement for the remake. Disney released a "special look" mini-trailer for the upcoming live-action "Aladdin" remake during the Grammys Sunday night that finally revealed Will Smith decked out as the all-powerful Genie. How’s everyone feeling about Will Smith’s Genie in ‘Aladdin’ ????? 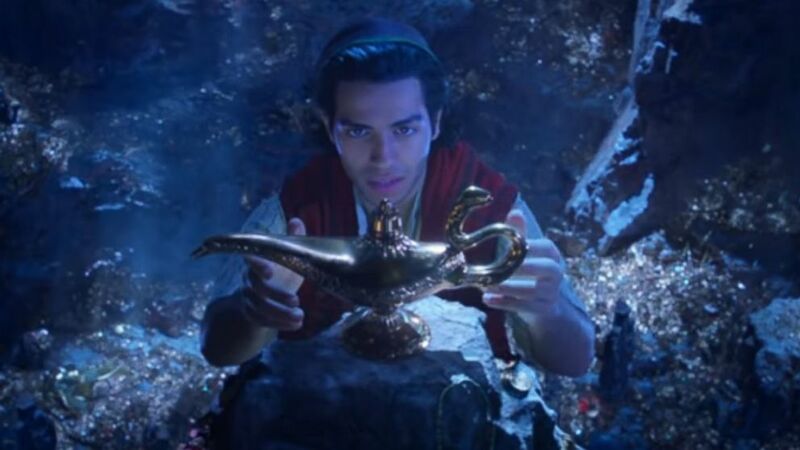 In the new trailer, Smith emerges from the famous lamp in an electric-blue tornado of smoke until we see him in all his glory: He's blue, all right, and bare-chested, with pointed ears and the Genie's signature beard and top knot. "You really don't know who I am?" he asks an incredulous Aladdin. "Genie, wishes, lamp -- none of that ringing a bell?" The sneak peek is little more than that: mostly glimpses of director Guy Ritchie's vision of the fictitious port city of Agrabah as the parrot Iago flies overhead. In December, everyone got a little bent out of shape when Entertainment Weekly's cover photo showed Smith as the Genie and he wasn't blue. Smith himself answered the haters on Instagram, posting in part: "LEMME OUT!! Can’t wait for y’all to see Me BLUE!" On Sunday, Smith took to Instagram, writing fans and haters: "I told y’all I was gon’ be Blue!! Y’all need to trust me more often!" "Aladdin," which is directed by Guy Ritchie, also stars Naomi Scott as Jasmine and Marwan Kenzari as Jafar. It hits theaters on May 24, 2019. (Disney ) A screen grab from the new "Aladdin" trailer. The original, animated "Aladdin" premiered in 1992 and famously starred the late Robin Williams in a virtuoso vocal performance as the Genie that earned him a Golden Globe. The movie has grossed $504 million worldwide.